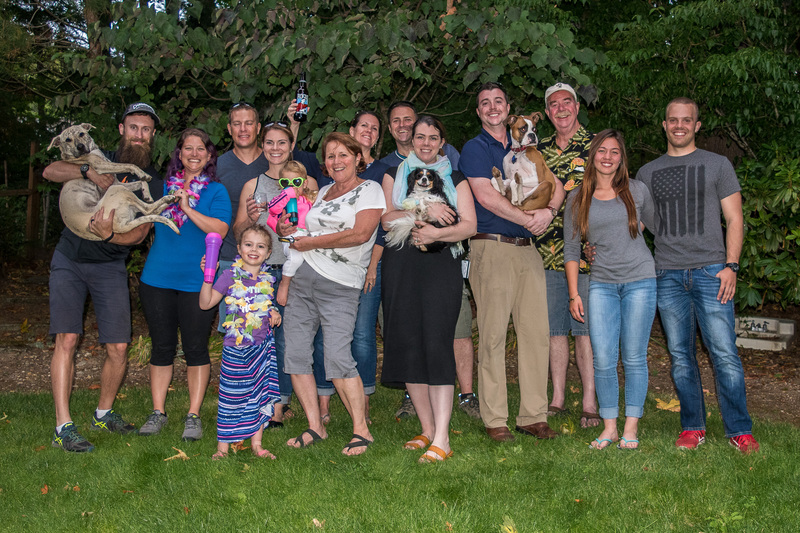 We were lucky to spend the last few days with family in the Seattle Metropolitan area. We hit the jackpot with weather – warm, but not too hot, which was a nice break from the overpowering heat in NorCal & Oregon. It was great to spend a few days playing tourist as well and spend quality time with my cousins. If you never have been to Seattle, we highly recommend a visit. For all of our Bay Area friends: Seattle is a slightly smaller version of San Francisco, minus the smell of urine on streets. Seattle is a growing city, in fact has one of worst commuter traffic in the country. They are now working on building up their infrastructure, building/extending their new light rail among many things. We couldn’t get over how green and fresh everything looked (coming from a state where water is scarce), Washington is green everywhere. The views of Mount Rainier added to the beautiful scenery. Its prominent peak was visible from many places including while driving around, as well as downtown Seattle. 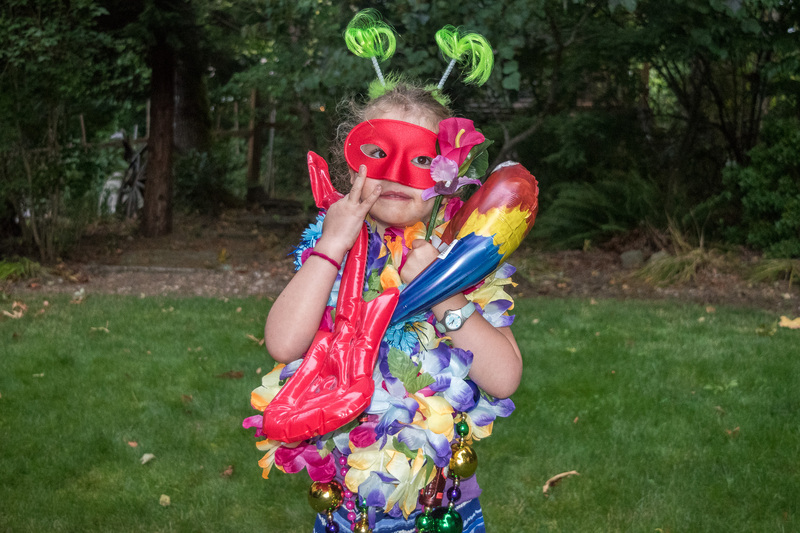 We stayed at Casa Chisholm in Renton, Washington. It was delightful to actually shower in a real adult size shower. You don’t realize what a luxury it is until you don’t have it. Gayle & Stuart were such great hosts! It was a treat to walk through their beautiful backyard every morning. If you are really lucky you may get an opportunity to see a deer passing through their yard. Staying with family, you are lucky enough to get to know each other better. For example, my cousins learned that Sparky prefers to drink from their backyard pond over fresh bowl water, Steve loves his sleeping in days, and that my eyes light up when Raisin Bran is in the house. They also learned that Sparky isn’t that smart, unless it comes to food related decisions – and then he becomes Einstein. Sparky enjoyed spending time with his cousin Dexter at the house. Both dogs are trouble, so they got along great. Dexter is a 12lb Cavalier King Charles Spaniel, who many in the family might say struggles to be a real dog. Having his much larger cousin around helped his confidence and he was acting like a “big dog” by the time we left. We arrived on Sunday and were given warm welcomes by my family. They hosted a “Burgers N’ Brews” barbecue, and local beers were aplenty. Steve and I were spoiled with Pale Ales, IPAs & ESPs from all over the Pacific Northwest. They were tasty. It was the first time in over ten years that I have seen the entire Harang/Zanotelli cousin clan. For those who can’t keep up with my family, these are my cousins on my mother’s father’s side – so second & third cousins. It was amazing meeting my newest cousins, Haidyn, Harper and Ben – I am in love. Ben’s smile can light up any room. When I was holding him, he loved looking at trees, and being swung in the swing set. He was fighting hard not to fall asleep in my arms, even though he did snooze for about five minutes. I was in awe of how smart Haidyn is. She was very articulate for a four year old and I enjoyed hearing her stories about school and being a big sister. I didn’t get to spend too much time with Harper, but got a sense that the girl is fearless and full of spark. She also didn’t enjoy sharing food with the dogs – sounds like a few kids I know…. Giulia…. Jenna. I can’t express how much I enjoyed seeing family. I am putting it out there – Harang/Zanotelli Reunion in 2018!! Let’s get talking! Monday was our day to play tourist. With both Sparky and Dexter in their respective crates, we made our way to Issaquah to catch the bus to downtown Seattle. The drive to Seattle is beautiful. We got off the bus in downtown at a park that had “jumbo sized” games to play. 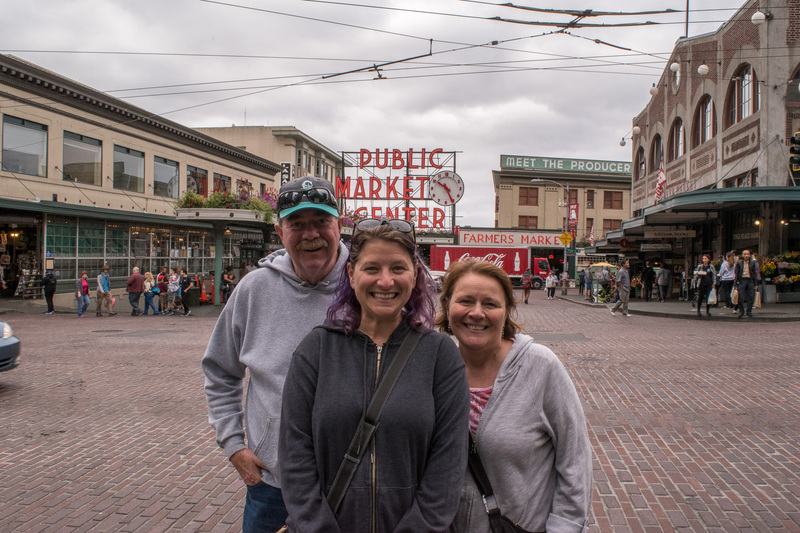 After beating Steve at Connect Four we made our way down to Pikes Place Market. First stop, the Gum Wall. After being both grossed out and amazed by it, we decided to add our own work of art. If you are in Seattle, check it out. 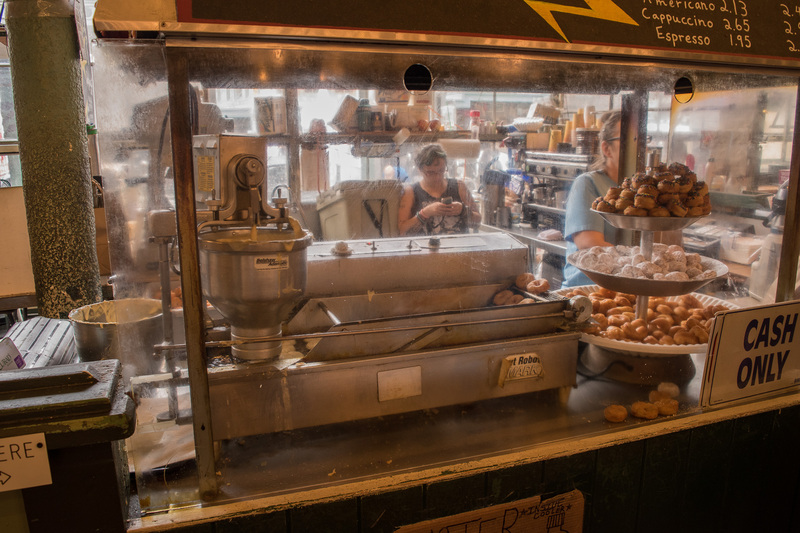 Pike Place Market is always an exciting place to be, it has the hustle and bustle of the crowds. We made sure to buy some donuts at the Daily Dozen Doughnut Company at the recommendation of our friends – Maple with Bacon, yes please. Delicious and fresh. We ate our donuts while watching them throw fish. Steve also had some world famous oyster shooters (minus the vodka). We ended our mini food tour with some cheese curds from Beecher’s! Yum! 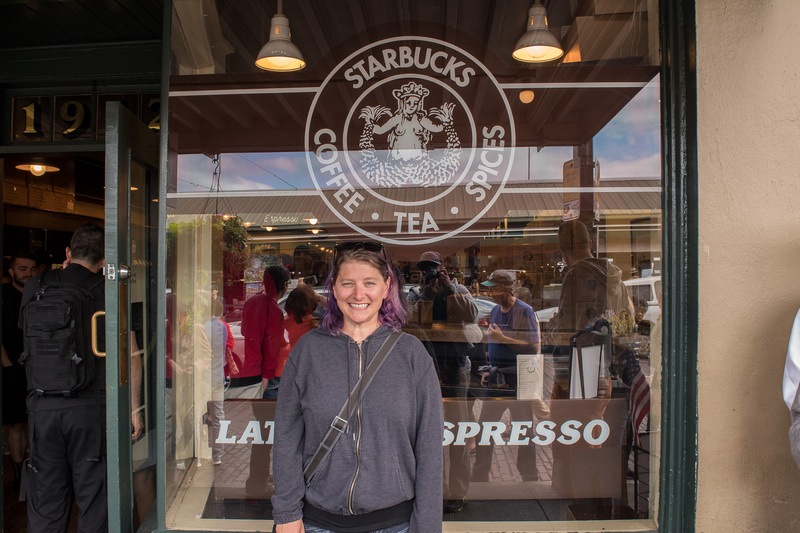 A trip to Seattle can’t be complete without your visit to the first Starbucks. The line to order was about four blocks long, so we skipped the coffee. After Pike Place Market we headed to Capital Hill, a young hipster area. It reminded us of the Mission in San Francisco. We enjoyed a beer and lunch at Elysian brewery (Also at the recommendation of our friends, thanks Peter and Chris). We also rode the new light rail down towards the waterfront. Their light rail was nice and new – if only BART can get refreshed like that, what a difference. 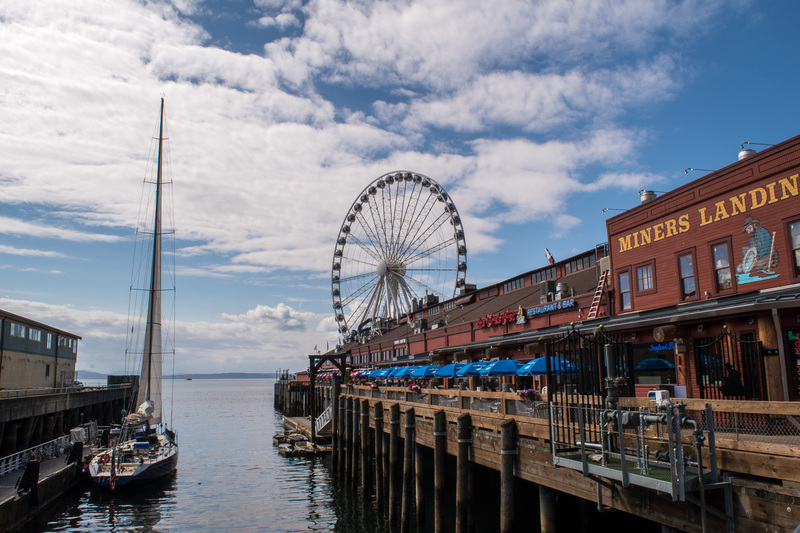 The waterfront of Seattle is a great spot for fun. It reminded me of Canary Row in Monterey – tons of fun shopping. We also got to ride the Seattle Great Wheel courtesy of my cousin Zach. The wheel is significantly smaller than the London Eye but has the same idea – great views of the Seattle skyline. We sat in the VIP pod, which included nice leather seating and a glass bottom. Incredible views of the city and where we saw the Space Needle. The Pier the Seattle Great Wheel is on has lots of restaurants and a giant arcade. They are also opening their “Wings over Washington” which will be similar to Disney’s “Soarin’” ride. Their grand opening is today; we missed it by just a few days. Bummer! Our family will have to tell us how it is and perhaps we will be back soon to ride it ourselves. We were on our way to Pioneer Square to go to Salumi, a place known for their dry salami, recommended by our friends in Oregon. Unfortunately, they close early on Mondays, and we weren’t there in time. If anyone has tried it, please let me know how it is. What a day, so we snoozed on the bus ride back to Issaquah and once we were home, the boys were happy to see us. We enjoyed the rest of the evening taking the boys for a long walk, eating fresh veggies, fruits and salmon burgers. Oh… of course wine. Tuesday was our day to get moving! 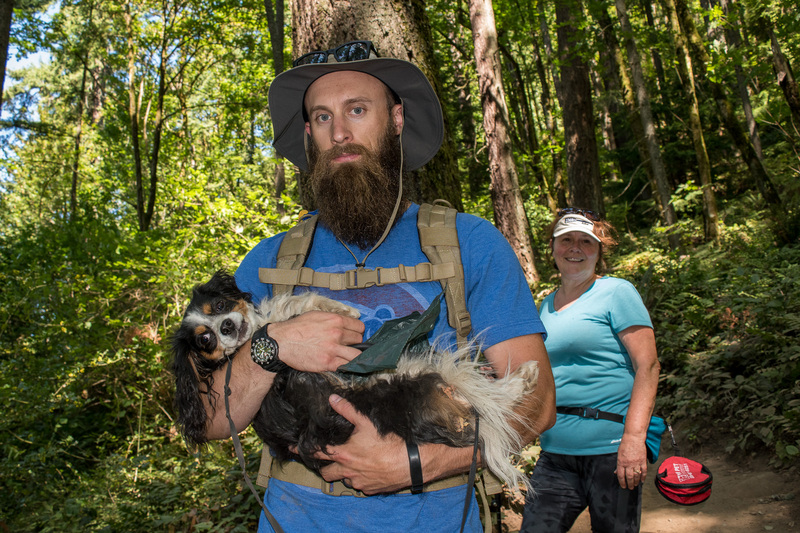 We enjoyed our sleeping in day, Steve especially, and set off to trek Poo Poo Point Trail by 10:30AM. The trail itself was challenging. We climbed over 1,600 feet in elevation within a 2.5 mile period. 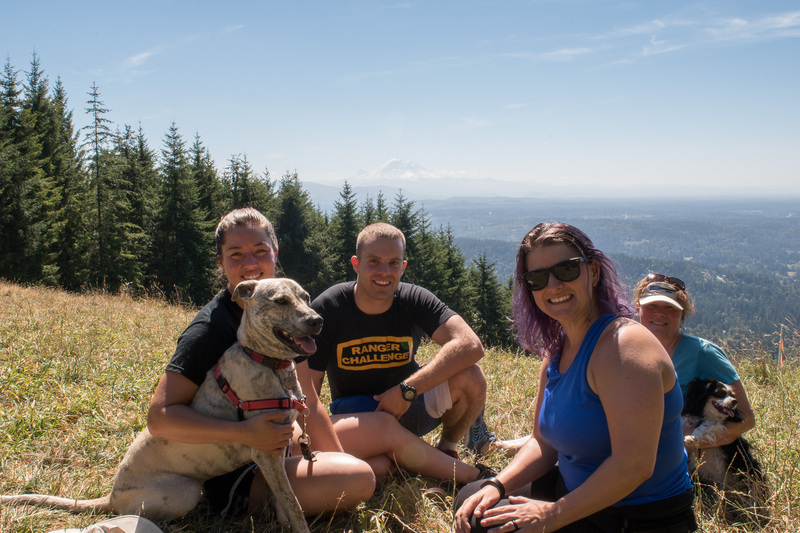 The top of the mountain offered fantastic views of Mount Rainier, the city of Bellevue and the city of Issaquah. 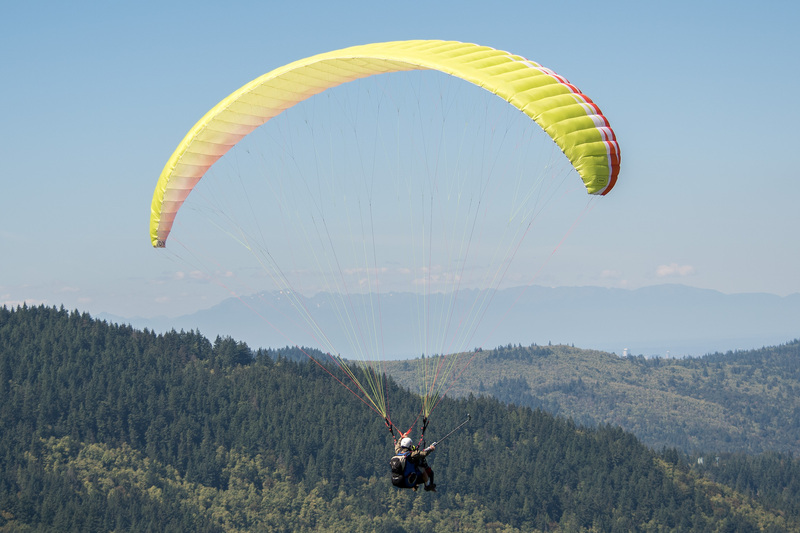 We were also entertained with para-gliders making their jumps off the cliff. The happy hikers also included my cousins Gayle and Julia and her boyfriend Derek, as well as little Dexter – who did the entire hike except for a half-mile (he got a ride with Steve). After the hike, we were treated to a meal at the Crab Pot, where my cousin Zach is the General Manager. We feasted on a delicious seafood boil dumped out on the table in front of us including: King Crab, Snow Crab, Mussels, Clams, Shrimp, Corn, Sausage, and Potatoes. Sadly we didn’t get a picture of the food – we were so hungry and forgot to take one. We also enjoyed a few pints of Mac & Jack’s beer – I think my new favorite beer! 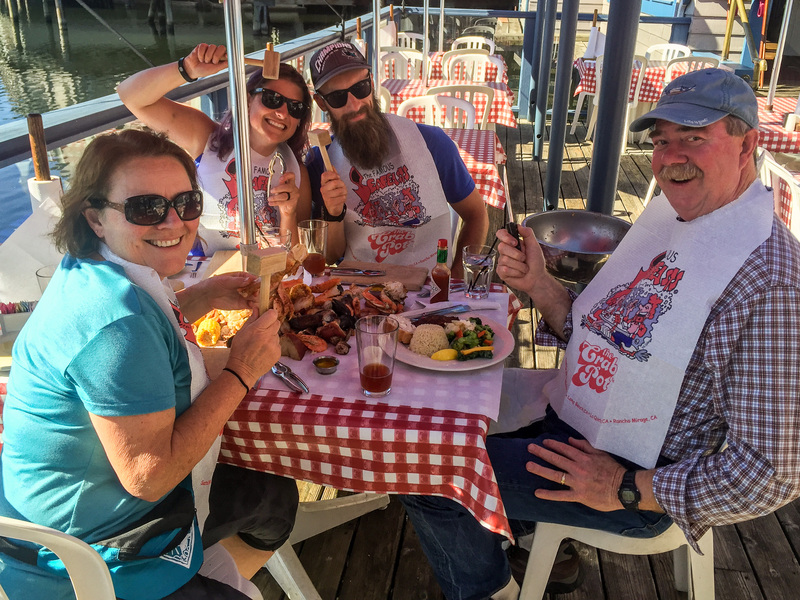 Steve was able to get his fill of Oysters at the Crab Pot! I think he may be oystered out… until we get to the next coast. For those Seattle (or Long Beach, CA) based readers, I would highly recommend the Crab Pot, and if you go, enjoy the coconut prawns – amazing!!! Like most stops, we also took care of laundry, our grocery shopping, and fueled up (even got a cheap gas station car wash to knock a layer of dead bugs off the truck). It was nice to go into a Safeway where there was quite a selection. We have been going to small town shops that a big store was a nice change. This morning we said goodbye to Gayle and Stuart (and Dexter too), making our way East to North Bend, WA. North Bend is such a cute town, and we had breakfast with Zach at Twedes Cafe – do you watch Twin Peaks, sounds familiar? Sparky got one more play-date with Maybell. After a filling breakfast, we hopped back on 90 East to our first stop of the day, The Gingko Petrified Forest. We checked out the interpretive center with lots of examples of petrified wood. There were great views of the Columbia River. While taking in the amazing views, we were treated to quite a show. 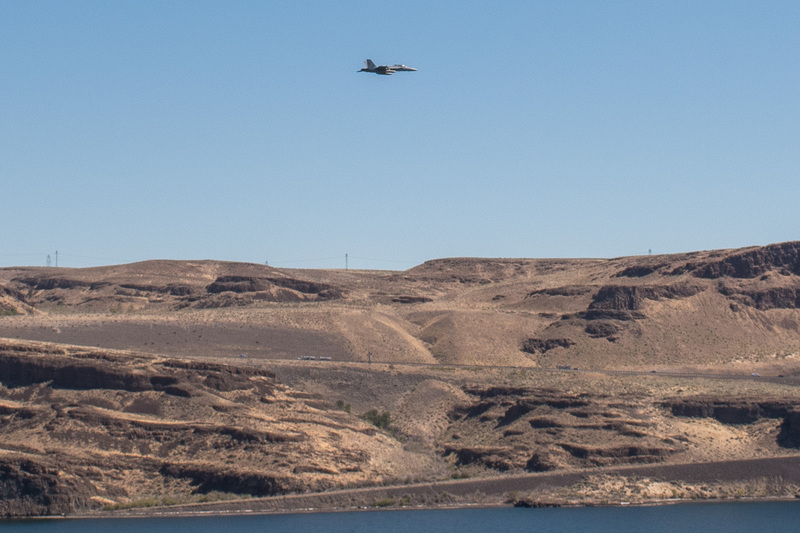 A F/A-18 did a fly by through the river canyon. Steve was just able to get the camera out and up to snap a few photos. We went down the road a few miles to check out the short hike with actual petrified logs to look at. It was disappointing to say the least. The paths were not well maintained, and the wood was covered in weeds. We didn’t complete the short hike, before retreating back to the truck and the A/C. If you are driving through, check out the interpretive center and views, but skip the hikes. We also made a stop at Coeur d’Alene Lake at the encouragement of my cousins Julia & Gayle. We were a little tight on time, so we didn’t spend long exploring the huge lake. The town of Coeur d’Alene was super cute and we would love to come back and spend some time exploring the lake and city further. After all, Barbara Walters calls it a “little slice of Heaven’. 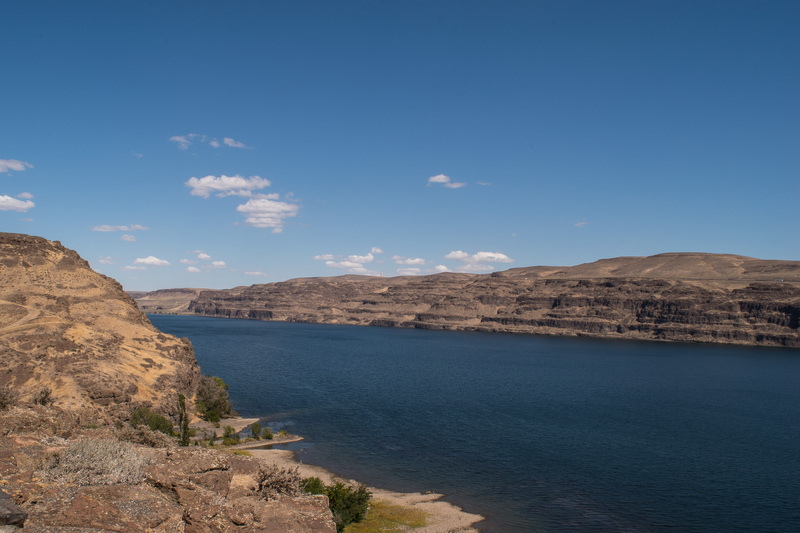 We should note that if you are an RV’r and you find yourself in Washington, about half of the Rest Stops have dump stations and fresh water fills (some even accommodate several rigs at a time)– which we took full advantage of. I feel like a broken record, we wish we could’ve spent more time in the area. The hiking is up our alley and the mix of outdoors and city is more of our speed. We would’ve loved to do a brewery tour as well. 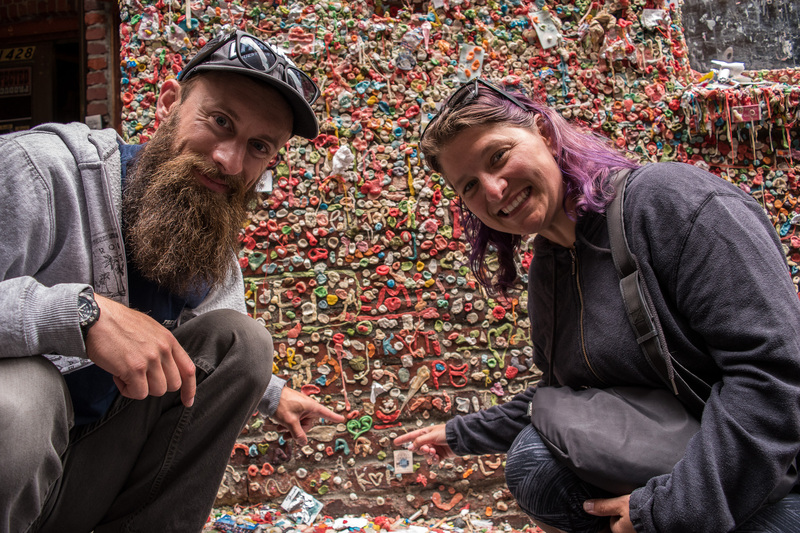 We didn’t get to do a ferry ride in Seattle or the Space Needle – both will be saved for next time. We also want to explore Mount Rainier National Park. Not in Washington, but on my radar is the Mount Saint Helens Historic Park, I was disappointed we didn’t drive past it from Oregon to Washington. Last night we made our way to Polsman Montana, and stayed at the Walmart parking lot. We got better sleep than we anticipated, but not the best. We leave shortly to go to Glacier National Park! 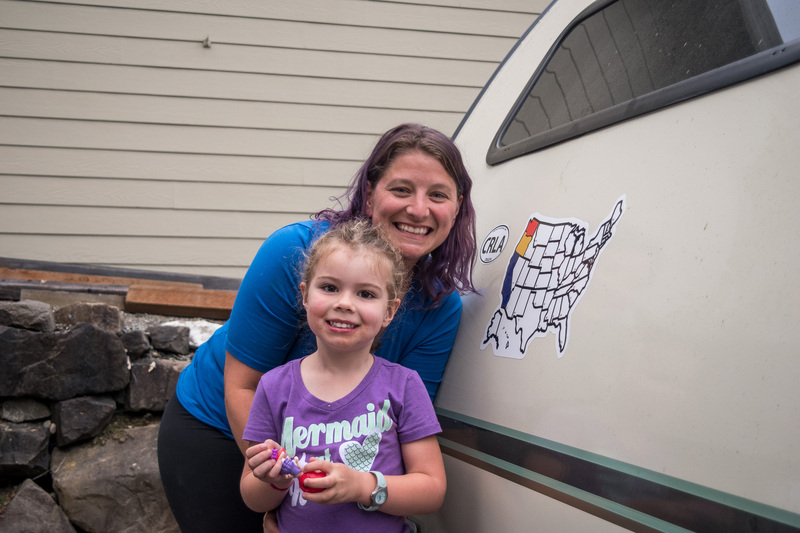 One thing we meant to do before we left was put a “Newly Weds” sticker on our trailer, but time got the best of us and we forgot. Amazon to the rescue, and our “Just Married” sticker arrived in Seattle. So far, only one car has honked at us. You can find more pictures of our trip in the header “Photos”. Thanks! Hady was just in Seattle last week for 2 days. You just missed each other! Looks like you’re having lots of fun. I love the Just Married sticker! Wow, you sure packed in a lot of sightseeing & activities in a compressed visit; what fun! Love the state and “Just Married” stickers too. Sparky needs a friend… Maybe Louie is up for the job?